Make sure to keep the potato salad refrigerated until serving. At a national potato salad contest I judged last summer, every entrant claimed to have the “best” recipe. After sampling more varieties than I can remember, I came to the obvious conclusion that taste is truly a matter of personal opinion. 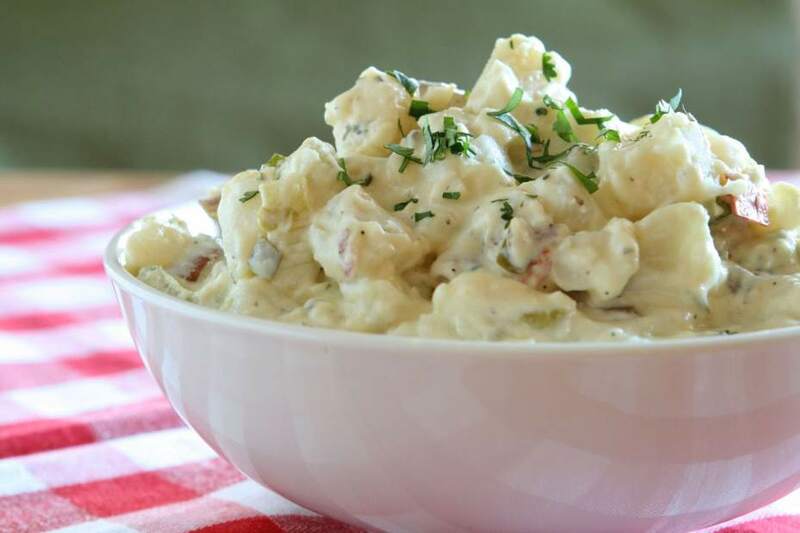 I couldn’t enter either of my potato salads into that contest but I still think either of these “coulda been a contender.” One has all the components of classic American potato salad with a little pizzazz. The secret ingredient is celery seed. This salad is creamy, mustardy and even includes chopped hard-boiled eggs. Make sure to keep the salad chilled at all times to avoid any health problems. My other recipe is a zesty, tomato-vinaigrette-dressed potato salad that has no dairy in it, so you can serve it at an outside gathering without worrying about leaving it in the sun. It is also perfect for those allergic to dairy. Much of the flavor comes from the sun-dried tomato pesto, balsamic vinegar and capers. I prefer unpeeled potatoes for potato salad because they add color (not to mention it saves time in the kitchen). Scrub them well since there can be dirt on them. 1. Wash and scrub off any dirt on the potatoes. 2. In a large pot of salted boiling water, cook the potatoes for 30 minutes or until tender but slightly resistant when pierced with a fork. Drain and cool. Do not peel. Cut into 2-inch chunks and place in a medium bowl. 3. In a small bowl, combine sour cream, mayonnaise, celery, scallions, celery seed, parsley, chopped egg, mustard, salt and pepper. Mix well. 4. Pour mixture over potatoes and mix gently until coated. Taste for seasoning. Refrigerate at least 2 hours or up to one day ahead. 5. To serve, transfer to a serving bowl and garnish with parsley. Serve cold. Advance preparation: Can be made one day ahead, covered and refrigerated. Remove from the refrigerator 15 minutes before serving. Taste for seasoning before serving. 1. In a small bowl, combine vinegars, mustard, tomato pesto, capers, salt, pepper and parsley. Whisk well to combine. Slowly stream in the olive oil, while whisking until the vinaigrette is emulsified. Set aside. 2. Wash and scrub off any dirt on the potatoes. 3. In a large pot of salted boiling water, cook potatoes about 20 to 25 minutes or until tender but slightly resistant when pierced with a fork. Drain and cool slightly. Cut into bite-sized chunks and place in a medium bowl. Pour the vinaigrette over the potatoes and mix gently until coated. Taste for seasoning. 4. Transfer into a serving bowl and refrigerate for at least 1 to 2 hours. Take out of the refrigerator 1 hour before serving. Garnish with parsley and serve. Advance preparation: This can be made one day ahead, covered and refrigerated. Make sure to remove from the refrigerator 1 hour before serving. Taste for seasoning. Got one more recipe to add on to my salad list.